It's a special week on Bake Off this week, because for the very first time, it's Botanical Week! The bakers must complete three challenges inspired by nature and are allowed to use any ingredients that grows to use in their bakes. Keeping with this theme, we thought we'd share a flowery based recipe that you can bake at home. This week, why not have a go at making these spectacular Vanilla Cupcakes? 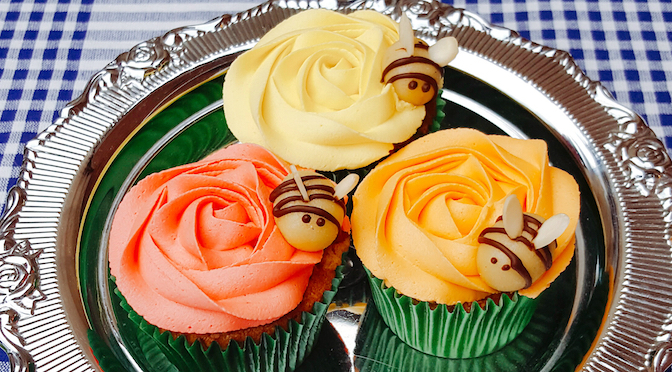 Created by the extremely talented Jamie from Jamie's Cookery, each of these fantastic cupcakes has been topped with a beautiful buttercream rose and features a marzipan bee. They're a great way to celebrate the last few days of summer. Not only do these cupcakes look great but they're also extremely easy to make! For more tasty recipes that are really easy to follow, we highly recommend that you head over to Jamie's blog; it's brimming with spectacular recipes! Step 1 - Pre-heat the oven to 175°C and place 12 cupcake cases into a cupcake or muffin tray, and set aside. Step 2 - Then, add the butter and caster sugar in to a bowl and mix well until they have all combined. Step 3 - Add the vanilla extract and the eggs - one at a time - mixing well after each egg. Step 4 - Finally, add the flour to the mixture and mix well - ensuring that you get all the flour off the edges of the bowl! This should provide you with a nice smooth batter. Step 5 - Spoon an equal amount of batter in to each case and pop them into the oven for around 12 - 15 minutes or until they are firm and golden brown. Once baked, put aside to cool. Step 1 - Put icing sugar, butter and vanilla into a mixing bowl and beat until a smooth thick buttecream is formed. If the buttercream is too stiff, then add a little milk to loosen it. If you want to do different coloured icing, divide your buttercream and use food colouring to reach your desired colour for each batch. Step 1 - Put all of the marzipan ingredients into a bowl and mix them until a firm ball is made. Step 2 - Then, roll twelve individual balls from this mixture - this will be your bees. Step 3 - Stick two flaked almonds into each bee to make the wings. Step 5 - Put your melted chocolate into a piping bag, snip off the end and use it to create stripes and eyes to complete your bees. Step 1 - Spoon the buttercream into a piping bag fitted with a Wilton 2D nozzle, then use it to pipe buttercream roses. To do this, start from of the cupcake and make a couple of outward circles, stopping when you reach the edge of the cupcake. Step 2 - Place a marzipan bee on to each cupcake. 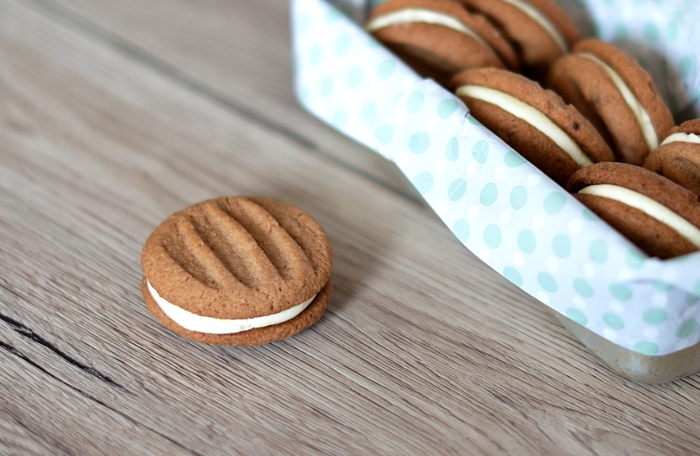 We're over the moon that the Great British Bake Off has returned to our TV screens, and this week on the show is themed around biscuits, so in keeping with the theme, we thought that it would only be right that we share with you a brilliant biscuit recipe that you can have a go at making at home. This week we've chosen to feature this Hungarian Chocolate Biscuits recipe from the brilliant Baking with Granny. Amy's blog filled with a whole range of different recipes and it's worth checking out if you're stuck for ideas on your next bake. This biscuit recipe is really simple to follow and includes ingredients you may already have in your cupboard. Get ready for Bake Off by baking this terrific biscuit recipe at home! Step 1 - Preheat your oven to 180°C. Step 2 - Grease your baking trays with a little portion of butter. Step 3 - Cream together the butter, sugar and vanilla extract on a medium speed until light and fluffy. Step 5 - Divide the mixture into small balls and place onto your baking tray with a small space in between. Flatten each ball lightly with a fork. Step 6 - Bake for 12-15 minutes, until they appear dry on top. Allow to cool on a wire rack. Step 1 - Mix the butter and icing sugar, to form the butter cream. Step 2 - Once the biscuits have cooled, pipe or spread a little of the butter cream onto half of the biscuits and sandwich together with the other halves. Wednesday marks the triumphant return of The Great British Bake Off, and all of us here at British Bakeware can't blooming wait for the return of Mary and Paul to our TV screens. The first week is cake week, so we thought it be fitting if we'd showcase a brilliant cake recipe for you to try at home. 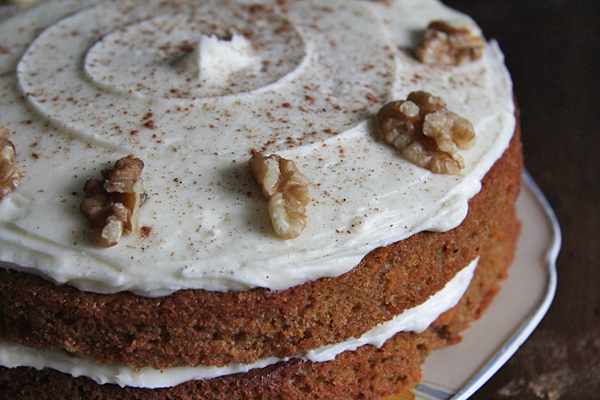 We've chosen to feature this brilliant Carrot and Walnut Cake recipe from the fantastic Tea & Cake Bakehouse. Rosie's blog is crammed full of brill recipes as well as reviews of places she's visited for breakfast and tea. If you're looking for a recipe blog that's a bit different from the norm, the Tea & Cake Bakehouse is perfect for you. Get in the full swing of The Great British Bake Off by baking this terrific and slightly healthy Carrot and Walnut Cake at home! Step 1 - Preheat your oven to Gas Mark 3/170°C. Step 2 - Butter and paper two 20cm loose bottomed cake tins. Step 3 - Cream together the butter and sugar until pale and fluffy. Mix in the eggs one at a time, mixing well after every addition. Add a little flour if the mixture begins to curdle. Step 4 - Sift together the flour, baking powder, cinnamon, nutmeg and salt. Add it slowly, until fully mixed. Step 5 - Add the grated carrots to the cake mixture, mixed thoroughly. Step 6 - Pour the mixture into your pre-prepared cake tins, and bake for 45-50 mins, or until the cake springs back when touched and a skewer, poked through your cake, come out clean. Step 7 - Allow the cake to cool in the tin before turning it out onto a wire rack, to cool completely. Step 1 - Trim your bottom layer cake so it's a flat surface for your top layer. Step 2 - Mix the icing sugar and butter until just combined, then add the cream cheese. Step 3 - Then add the milk in tiny parts to keep the mixture moist. Mix on a high speed until soft and fluffy. Step 4 - Divide the mix roughly into thirds. Spoon two thirds on to the top of the bottom cake layer, and spread to approx 5mm from the edge. Then place the top layer on. Step 5 - Then, spoon the rest of the mix onto the top and spread to the edges. Decorate with walnut halves and a sprinkle a pinch of cinnamon and nutmeg on top. For the full the recipe, visit Rosie's blog here.